From humble beginnings, UF Health Shands Arts in Medicine has grown into one of the largest comprehensive arts in healthcare programs in existence. Starting with two volunteer visual artists working on the Bone Marrow Transplant Unit, Arts in Medicine now has 16 paid artists in all art disciplines working in six separate buildings throughout the UF Health system, covering the Gainesville and Jacksonville communities. While Arts in Medicine’s main focus has been on applying the arts to patient care, they are also dedicated to expanding their reach beyond the hospital walls. 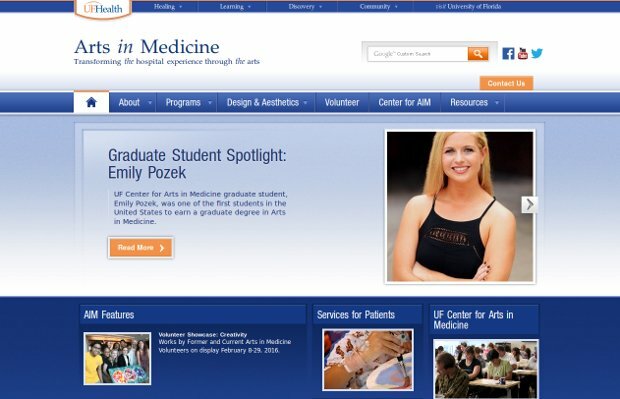 Other developing aspects of the program include: Education – course work in arts in healthcare for art, medical and nursing students Research – partnering with clinicians to develop and implement quantitative studies that demonstrate the effects of arts in health care Collaborations – partnering with community arts organizations and other hospital departments to bring the message of the arts and wellness to the larger community.